For a super cute dorm room decorating idea, why don't you invite monkeys to be your college dorm roommates? 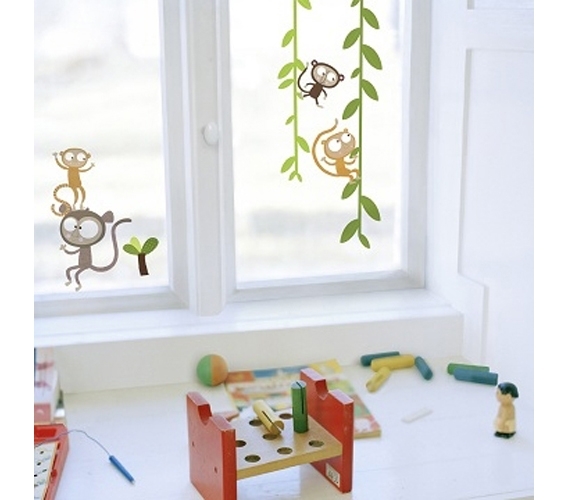 This Monkeys - Window Peel N Stick easily sticks to your dorm room window without leaving any sticky residue, scratches, or messes that could get you into trouble at the end of the year. With this Monkeys - Window Peel N Stick, the monkey so their job to lighten up your dorm room by happily swinging around on green vines. The Monkeys - Window Peel N Stick makes a cool dorm room decoration for those who are looking to give their dorm room a very UNserious dorm decor look. College can be serious enough, and these monkeys are perfect for lightening up the mood - any time! The best part of this Monkeys - Window Peel N Stick is that you can take them down easily when it's time for a change. Peel N' Stick is perfectly dorm room safe and is a fun way to add cute decor accents to your dorm room.